One can only imagine a first-comer’s intro to Steven Universe going straight into Season 3 double-feature premiere. Watermelon guys, humanoid-shaped sentient rocks saving the world with their half-human, half-Gem surrogate son Steven, humanoid sentient rocks combining into bigger sentient rocks for psychological effect (like double-Digivolving in Digimon, anime fans). The opening is surreal. No, not because we learned that the disappeared Stevenmelons from “Watermelon Sevens” are fostering a functioning civilization on a tropical island, planting baby watermelons to raise, choosing a sacrificial watermelon to a giant entity (ok, maybe the functional society is a tad archaic), such imagery is the norm of Steven Universe, but because Steven Universe himself is not on-screen for the first minute. In a show that often anchored to the scope of his point-of-view or proximity, this is head-scratching and led me to wonder if the show was moving beyond Steven’s limited child scope where the narrative tension of unanswered questions coexisted with his coming-of-age. Turns out, Steven wasn’t “offscreen.” He wakes up near the barn realizing he has accidentally slipped into his underdeveloped telepathy, a-la James Cameron’s Avatar, where his mind controls another body-shell elsewhere. Through the melon’s eyes, he has located Malachite and the Crystal Gems drop the Cluster drilling project to defeat it. I will refrain from gushing about the showdown between Alexandrite, the Crystal Gem’s three-way fusion, and Malachite, reminiscent of adrenaline-fueled combat between big mega robots fighting monsters in Pacific Rim. There’s a dynamic to note: although Jasper loathed fusion (due to Gem-taboos) and resorted to coercing the mild-mannered Lapis Lazuli into fusion only to defeat the Crystal Gems, she and Lapis Lazuli reach a quick pact and attack with mutual will. For Steven’s safety, Garnet chooses to leave him behind with Peridot. 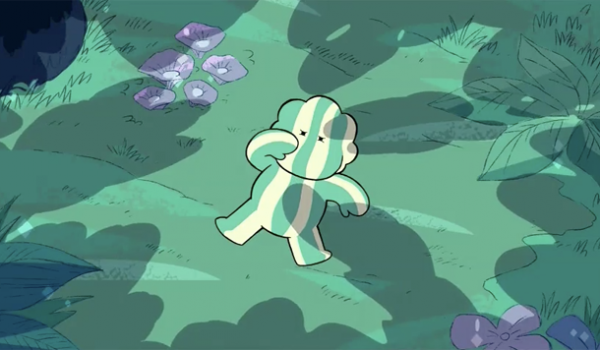 He loopholes around Garnet’s orders with his watermelon connection, gaining control over his telepathy into a Stevenmelon body to fight Malachite and to remain uninjured with the parameters of Garnet’s concerns. The boy has grown enough to challenge his guardians with respect and dig out alternatives, proving that healthy relationship relies on the balance between parental’ guidance and the agency of this child. Peridot deadpans this priceless line, “You’re such an anarchist,” even though Steven wants to stay in the bounds of dutiful. The cliffhanger of “Watermelon Island” rings as an intense bookend when circumstances disallow the Crystal Gems from aiding Steven and Peridot with the drill. Despite happily proving his growth, he’s overwhelmed into sudden independence. He’s a child who realizes his parents won’t hold his hand anymore, Though Steven is always happy to prove that the Gems can depend on him, this independence is a sudden new concept to him. While Malachite is unmistakably a conflict that needs to be punched by the combat-driven Crystal Gems—Steven participates in the punches through melon-powers, perhaps not naïve that this does technically entail striking his friend Lapis—the solution to the Cluster is indecipherable. In the small confines of the drill as he and Peridot slink into the core, there’s a quiet twinkle of introspective existentialism where the sight of the lava reminds Peridot of her origin. Peridot simply states, first she didn’t exist, and then she was there. And then she had feelings, feelings for her place of origin, even if she lost faith in her liege Yellow Diamond. While she’s settled in a new purpose and integrated into the Crystal Gems, she’s still a Homeworld Gem at her core, perhaps with the identical homesickness that occasionally plagued Pearl. 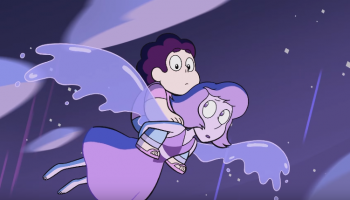 Paragraphs of science-fiction novels would expound on the alien functions, but in the delightful TV medium of Steven Universe, they are explained in emotional framing and the economy of the script. Sometimes the recaps are subliminal. For example, the meshed Gem-mutants, sprung from nonconsenually-fused Gem-shards, from “Keep It Together” crawl around to remind long-time viewers, they were just the prototype to condition the audience for the terrible Cluster. Peridot exposits this ghastly clarification: the Gem-shards, though sentient, cannot ever recover to full form, and are in the “ceased to be” cessation stage. While it’s difficult to dissect it in words because what “ceased to be” for alien Gems is not equivocal to what “ceased to be” means to humans. The Gem-shards Mutants (presumably the Cluster as well) are essential “zombies,” in the classification of “far-gone,” and ensnared in an irreversibility of shattered yet semi-functional awareness. Choosing to reason with a zombie is not socially acceptable as it is pragmatically fatal in popular culture. Once Peridot and Steven reached the Cluster, it’s a sea of crystals bounded together in a sphere, not yet abomination like the Mutant Gems (at least, it hasn’t taken form), almost like a planet of uncharted territory with enigmatic beauty and horror. Harkening back to the chilling “I Must Scream” imagery of the Mutant Gem in “Keeping it Together” ultimately suggest, it’s un-ignorable calamity to terminate the Cluster since it’s made of the billion fragments of consciousness of innocent Gems, including those who presumably helped Rose protect Earth. But everything runs so urgent that Peridot knows there’s little occasion for other ethical applicability. The ever-compassionate Steven pleads, “It doesn’t know what’s it doing!” She weights out his plea but the situations tips over and she cries back, “But it’s still going to do it” and even Steven has to agree that drilling further is the only known solution. But luckily a third option materializes through the artful storyboarding, as Steven’s panic attack manifests into telepathic communication with the Cluster. The Cluster set stage for one of the most visually ethereal realm in all of animated shows as Steven manifest into their hive mind and heeds the fractured echoed and whispered consciousness of fragmented sentients who pine for their lost parts to reclaim their “wholeness.” Although these Gems-shards were forced together without consent, Steven shows that they can confide in the other individual shards. There’s humor laced in, as Steven blubbers aloud that he’s in their “brain or brains?” showing that his human mind has to break things down in human terms. While we are accustomed to the images of humans, even the Crystal Gems are shaped like humans, a form comfortable to our eyes, the uncanny fact is that the Cluster-shards are shown as shards with restricted communication. They are not shaped as humans like the Crystal Gems or have the mobility of facial and bodily expressions, yet we can decipher how they are feeling while absorbing their alien aura. Steven demonstrates a new approach of “wholeness” through a mutual bubbling technique. And it’s also the Cluster that saves itself, and by extension, the Earth. Even though the dreaded Cluster arc, or at least a phase of it, has concluded soundly, there are still billions of loose threads of Steven Universe to contend to (see Musings). To look forward to. Because forward is where this show has been going. Forward is where Steven is going. The final shot and the concluding ambiance like tranquil heartbeats is a resonate paradox of visual and sound, as if the bubbled Cluster-Gems, technically inorganic entities, have converted into an organic element within the womb of the Earth, signaling that something beautiful—and beneficial to Earth—might be born later. Lapis Lazuli, when she regains consciousness, would not be comfortable around the Crystal Gems, since even she and Jasper mutually channeled their resentment toward the Crystal Gems. Jasper, who slipped into the Earth’s core before the Crystal Gems could grab her is a loose end, haunting the minds of fans. With her mane-hair concealing her face, and thus her Gem at her nose, one can guess that her Gem would be cracked in a later episode.